To best grasp the mosque's design, enter the complex via the Hippodrome rather than from Sultanahmet Park. Once inside the courtyard, which is the same size as the mosque's interior, you'll appreciate the building's perfect proportions. İstanbul's most photogenic building was the grand project of Sultan Ahmet I (r 1603–17), whose tomb is located on the north side of the site facing Sultanahmet Park. The mosque's wonderfully curvaceous exterior features a cascade of domes and six slender minarets. Blue İznik tiles adorn the interior and give the building its unofficial but commonly used name. With the mosque's exterior, the architect, Sedefkâr Mehmet Ağa, managed to orchestrate a visual wham-bam effect similar to that of nearby star Aya Sofya's interior. 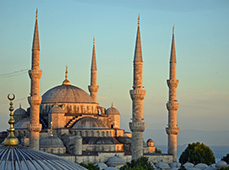 Its curves are voluptuous; it has six minarets (more than any other mosque at the time it was built); and its courtyard is the biggest of all of the Ottoman mosques. The interior has a similarly grand scale: the İznik tiles number in the tens of thousands; there are 260 windows; and the central prayer space is huge.